Snyder’s Nursery is a family owned business that has been steadily growing over the past thirty years. Owner, Kent Snyder started the nursery with just a small group of plants and a pile of mulch on his family’s farmland in Nippenose Valley. Little by little stock increased to feed his growing landscape business. Check out our Products page to learn more about our supplies and our suppliers. Take a look a our Photo Gallery page to see a sample of our ever changing plant inventory. 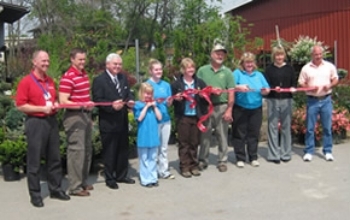 In 2009 Snyders Nursery moved to their current location the historic former site of Keebler's Feed Store. On April 26, 2014 we celebrated our 25th anniversary with some of our family and loyal customers. The Montoursville Garden Club presented a personalized rock with the company name on it. It was a fun and enjoyable day with family and loyal customers.